This past Saturday, I took an hour drive down to Princeton to visit my college friend Daniel to begin Part One of my “collegiate weekend” (I headed up to Lehigh the following day). After having multiple people tell me that I should check out this place called Hoagie Haven while I was in the area, we decided to head over there to grab lunch. 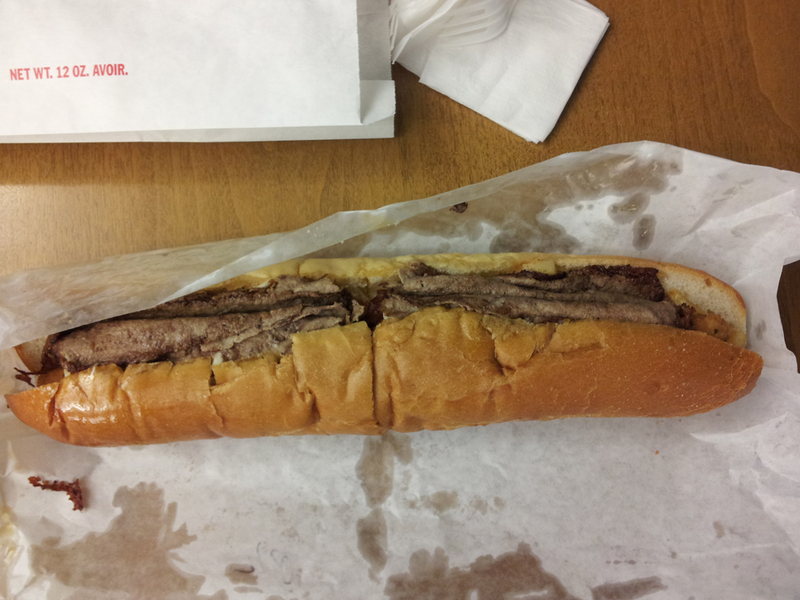 Only two words came to mind when thinking about what to get: fat sandwich. 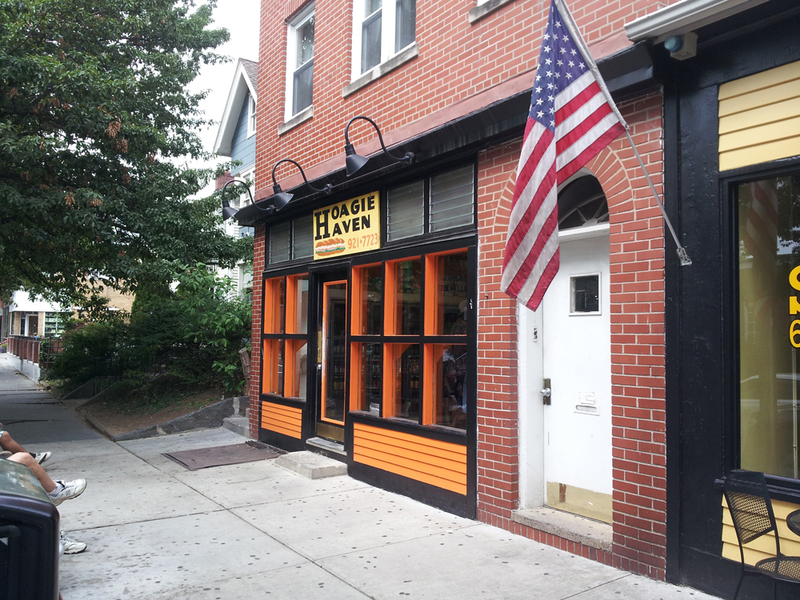 It’s not exactly the most gourmet thing that you can get, but if a place does it well (and Hoagie Haven did), then your stomach is one happy camper. The commonality between the fat sandwiches that I have tried is taking ordinary ingredients that typically won’t go into a sandwich and melding them together. Take, for example, the Sanchez: chicken fingers, mozzarella sticks, French fries, melted American cheese, and some spicy mayo. Not your ordinary sandwich ingredients, but put them all together and it was pretty darn tasty. The Phat Lady that I ordered had thin-sliced steak, mozzarella sticks, French fries, and buffalo sauce. Many of their fat sandwiches are enough to leave you feeling pretty fat (I mean, full…) for a few hours; if you are adventurous enough to finish one of their full-sized sandwiches in one sitting, you might just be taking a pass on your next meal. Daniel and I tried half of both the Sanchez and the Phat Lady, and I have to say that the Sanchez tasted better. 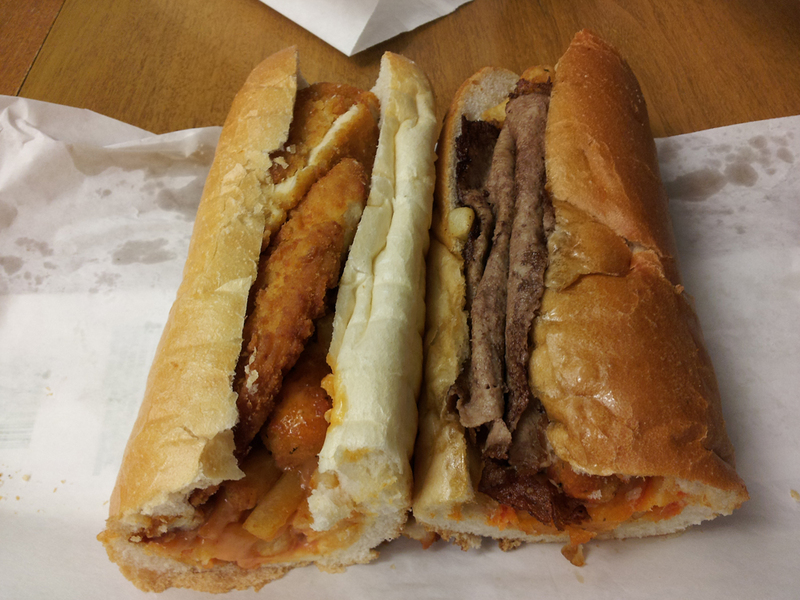 Both sandwiches were meaty and had flavor from their respective sauces, but I think I preferred having the chicken fingers over the thin steak slices. I do have to say that I was also a fan of that spicy mayo as well. The storefront is just a storefront, nothing more. There isn’t any place to sit down to eat, and they only accept cash. There is a lot of room to stand inside while you are waiting to place your order (and I’m sure this place gets crowded from time to time). I see many people usually just take their sandwiches right outside and eat it on the bench. I’m always a fan of being adventurous with food, and this is place is no exception. I would love to try their other sandwiches, but I’m sure that I’ll need to space out any potential trips back here for fear of clogging up my arteries. Good offerings and great tasting sandwich combos. You can’t ask for much more. As just a service counter to place your sandwich order, the storefront is pretty standard. One thing that I found pretty cool was a photo mural on the left wall that depicted the different regions of the world where the Hoagie Haven fans have taken pictures with their shirts. Really quick turnaround for my sandwich, probably less than 4 minutes. That’s excellent, since the smell is enough to make you hungry! For the amount of food that you get, the average sandwich price of about $10 is extremely reasonable. Have you gone to grease trucks at Rutgers? Yep, and I have to say that both are quite good from my initial impressions.